Dream Retreat on Gloucester Pool – Trent Severn Waterway built in 2018. It is the perfect blend of cottage with the comforts of home. 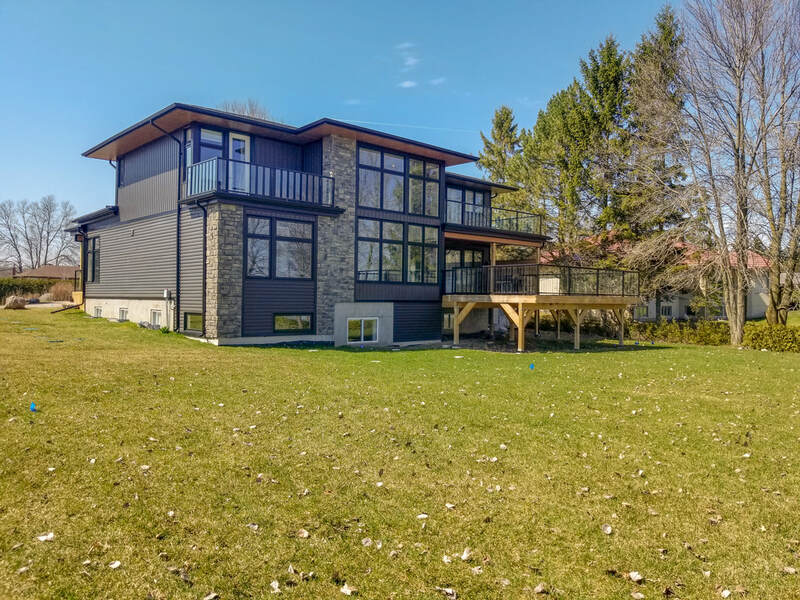 The Great room offers a great space to entertain with a wood burning fireplace and large windows allowing for lake views.​ 4 bedrooms, 4 bathrooms with Main (entry) level has open concept great room, dining room and kitchen with walkout to deck overlooking the lake. A 4 Season Muskoka room with views of the waterfront gives you another relaxing space for conversation. Beautiful chefs kitchen with custom island. Just off the kitchen is the mud room and laundry room - a beautiful surprise. Main floor Master with en-suite has frameless glass shower, soaker tub and 2 sinks. Relax...you’re living at the cottage! Imagine enjoying the lovely Severn River views all year round! Custom built, this private 3127 square foot 4 seasons cottage comes with 5 acres too. 4 bedroom , 2 bathrooms this cottage has lots of entertaining space. A Great room, warmed by the wood fireplace with ventilator to take the warmth through out the cottage, has gorgeous flooring, soaring ceiling and a wall of windows providing treed and river views. Prepare meals and dine from the custom Maple kitchen with induction range and stainless appliances, granite topped island used as a table for the kitchen which leads to an open deck down to the water’s edge. This cottage is built close to the waters edge- you can hear the water from the kitchen with beautiful panoramic views of Georgian bay on your deck. A terrific place to find peace and quiet while still being within close proximity to the Town of Midland or Coldwater. 3 bedroom and 2 bathroom 4-seasons Cottage has an open Concept Main Floor with Kitchen and Dining room just off the main deck and Wall of Windows to let in the natural light and to enjoy the expansive views outside. Great Room living area is intimate and relaxing just off the kitchen and dining area. There is a 3 piece bath with shower as well as a bedroom on the main floor.